Join Me For the Back in the Day 10K! | Eat. Blog. Run. Home >> Blog >> Join Me For the Back in the Day 10K! Ever since rounding up Boston-area 10Ks and pondering half-marathons I’ve been wondering about my next (longer than a 5K) race. I couldn’t find a 10K with a date and location that worked for me (I personally don’t like having to drive more than 20 minutes to run a race!). And though I’ve been pondering half marathons, I couldn’t quite take the plunge and sign up for a half (despite everyone saying you just need to sign up) without having gotten a 10K race under my belt first. 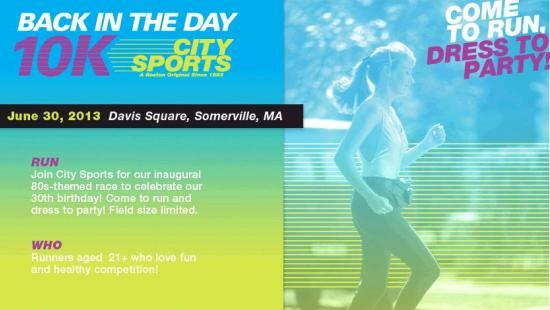 So I was thrilled when I received an e-mail last week about the City Sports 10K on June 30. The timing and location are perfect. The only thing that scares me a little is that there will be HILLS. But, I’ll walk ‘em (or run ‘em really slowly) if I have to. I’m super excited to finally have a 10K on the calendar; it’s my first and I hope it will be awesome. Want to join me? Good for you doing a 10k. You absolutely have it in you. Don’t be embarrassed to walk the hills or afraid to train for ‘em. актуально, буду принимать участие в обсуждении.